Does Tahitian Noni International (Morinda) purchase their Noni from another source? What is the chemical breakdown of Tahitian Noni® Juice? What is the absorption rate of Tahitian Noni® Juice? Is Tahitian Noni® Juice safe for kids? What is the best way to use Tahitian Noni® Juice? What does Tahitian Noni® Juice do? Will Tahitian Noni International (Morinda) continue to develop other products? Why is Tahitian Noni® juice packaged in a glass container? Wouldn't it be less expensive to ship if it were in a plastic container? 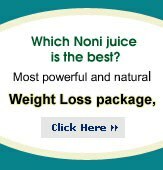 What if I stop drinking Tahitian Noni® juice it, do all your previous aches and pains return? If the affects last, how long? How much sugar is in the Tahitian Noni® Juice? Do you know of any good books on Noni fruit or Noni Juice?